Today we’re thrilled to launch a new topic series on the Sidewalk blog that stems from reader requests. It is great to go on an individual Sidewalk to explore a neighborhood’s culture, history, food and art, but if one wants to gain an appreciation for an entire city, which Sidewalks should one explore? Said differently, which collection of Sidewalks jointly portray a comprehensive snapshot of a city? Our editorial team debated this challenge; how can a city be summed up in just three or so walks? And yet, we understand the need for thoughtful itineraries that link together the most representative, fascinating, delicious and unexpected places in a city. Our rules: we’ll curate a 12-hour program based on a city and a theme. Topics can range from history to hipster, touristy to trendy. What we ask of you: let us know which cities & themes you’d like to see, and share your reactions to each itinerary. And of course, if you know of someone in need, please share the itinerary with them! For decades, Downtown Los Angeles was a crime-laden ghost town of crumbling facades, syringe-scattered alleyways and abandoned hopes. This collapse was provoked by the advent of automobiles and highways that helped Angelinos relocate to the lush Hollywood Hills and cool Pacific coastline. Nobody visited Downtown LA if they could help it, and if they had to, they would clap shut the tops of their convertibles, lock their cars and pray the sun did not set on them. Those days are long gone. DTLA is rediscovered and revived. The neighborhood is abuzz with innovative restaurants, hip bars and twenty- and thirtysomethings who have unearthed Art Deco loft spaces, a conveniently centralized location and relatively inexpensive rents. This collection of three Sidewalks shares the stories, cultural icons and context to gain a newfound appreciation for the rise, fall and rise of Downtown LA. Stroll the Historic Core of Downtown Los Angeles for portraits into the city's founding, roaring heyday, crumble into decay, and today's trendy revival. Start at a contemporary skyscraper, ride a pink funicular, sample third-wave espresso and farm-to-table egg sandwiches in a beloved food market, and explore a trio of architectural jewels. Egg sandwich from EggSlut. Photo: EggSlut. On the northern outskirts of DTLA is a food mecca of culinary treats and cheap eats - the perfect place for a late lunch or early dinner. Discover tasty dim sum buns and dumplings, egg custard tarts, Taiwanese boba tea and the prototypical LA dessert: Fresh Strawberry Cake. As you proceed along the Sidewalk, you’ll witness how the neighborhood juggles the aging low-income Chinese population with its expanding multi-ethnic youthful professionals. 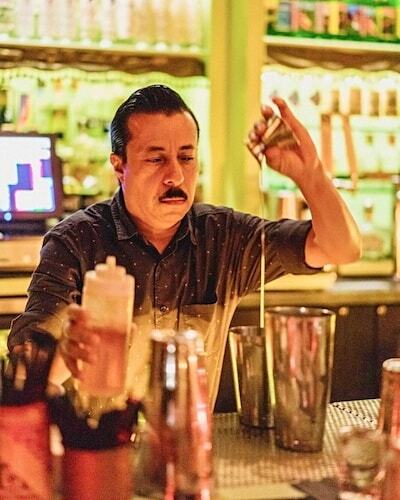 To truly understand the DTLA renaissance, one needs to witness the thriving cocktail and bar scene. The vestiges of Art Deco interiors and industrial spaces provide beyond-hip ambiance for innovative mixologists. Take in the nightlife that brought Angelinos back downtown: a cabaret in a retired power plant, a speakeasy hidden in a French Dip restaurant, an indoor/outdoor beer tavern, a masterful tequila bar. This is the perfect ending to a day in the new DTLA. The Edison in the former DTLA powerplant. Photo: rockandegg. Enter The Varnish through a secret door in Cole’s French Dip. Photo: thevarnishbar.